Posting on Instagram has been fun. Its easy to take a picture at the end of the day and write a sentence or two about what you’ve been doing. So here’s what I’ve been doing since my last post. My Instagram name is debbyschnabel. 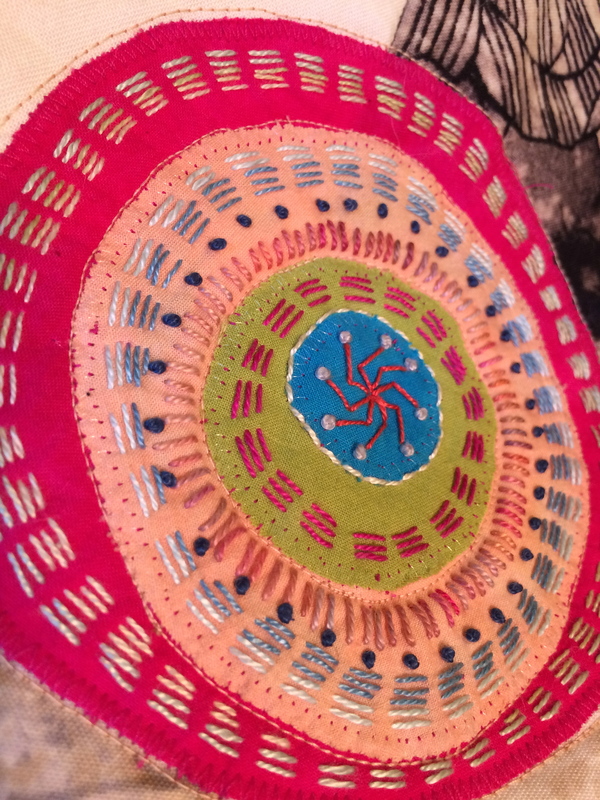 I finished another kantha blanket. 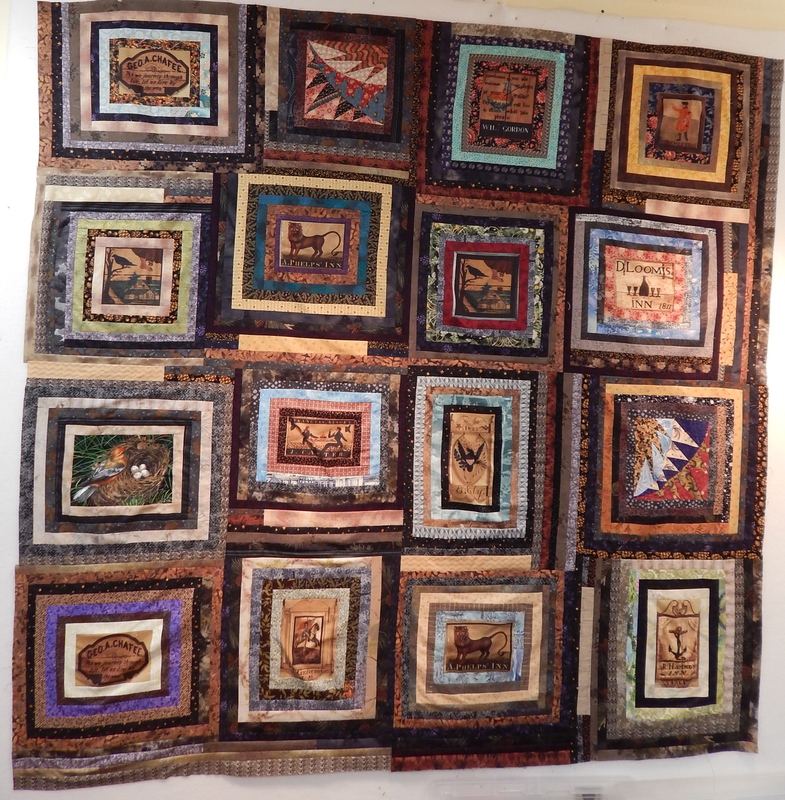 This is one I pieced last fall just before I went to Art Quilt Tahoe. I really liked the central tree panel, and just chose some nice fabrics to go along with it. Still needs to be washed and blocked a bit. 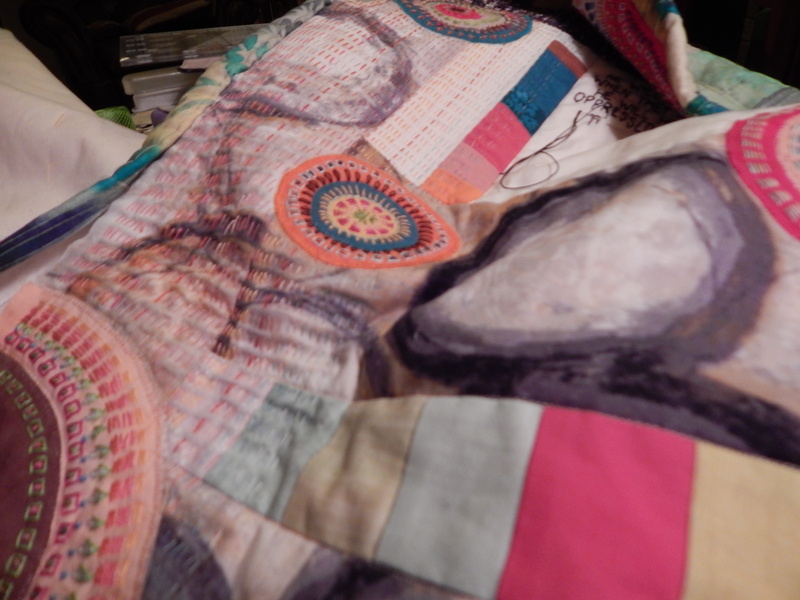 Taking a break from embroidering on the Wonderful Counselor quilt. Considering next steps. I think I still need some embroidery in there between the words. And maybe some embroidery in the borders, although I do plan to machine quilt most of the borders. I started working consistently on the big PEACE quilt. While it was still on the design wall, I chose 12 spots to put verses and marked those spots with the blue disappearing ink, and chose 12 verses about peace. Its been fun to choose a verse, write it in the spot, and get it embroidered on there. I am hoping that this will be the next quilt I machine quilt. 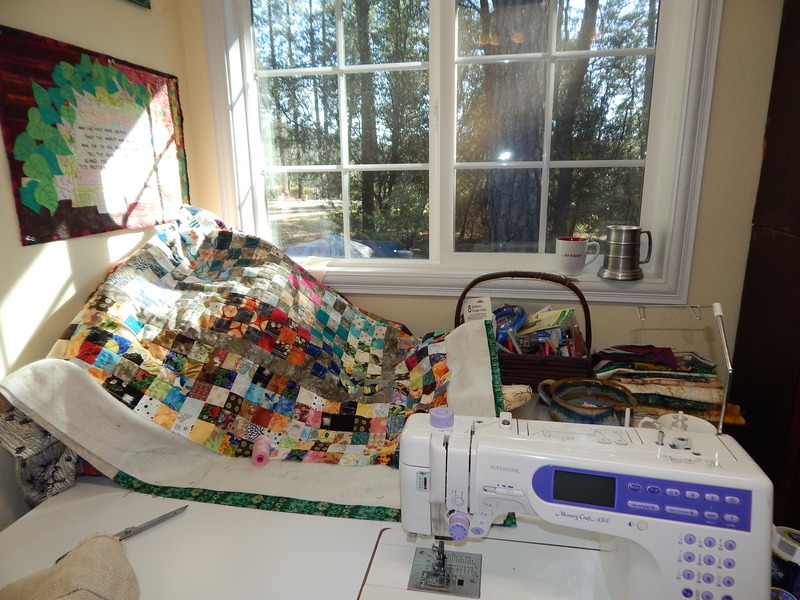 Right now this quilt is under the Juki. I am taking my time and trying to quilt it nicely. I made it a long time ago, and I still like it. 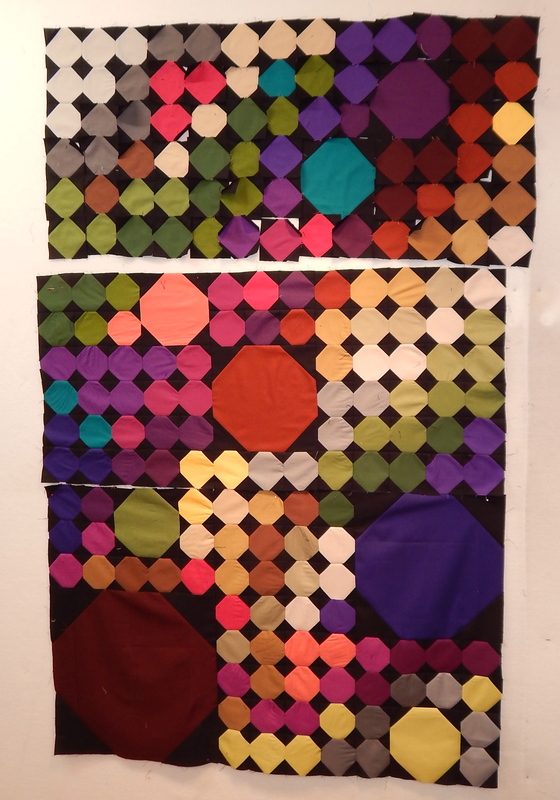 I got it into my head that I should do another sample quilt from the quilt kits I put together. So fun to make small pieces like this. The small pink triangles are actually the leftover pieces from cutting out the big pink circle! 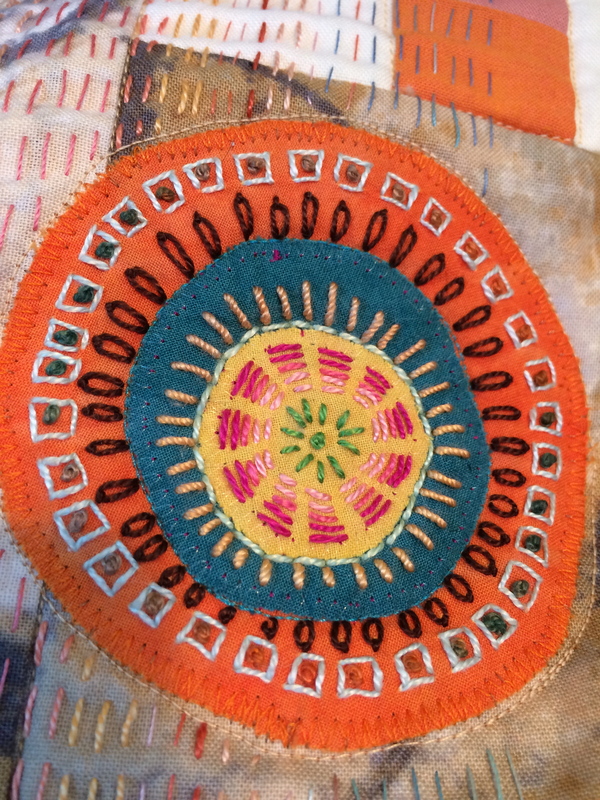 I am teaching Quilted Embroidery at the Cotton Patch on April 21. 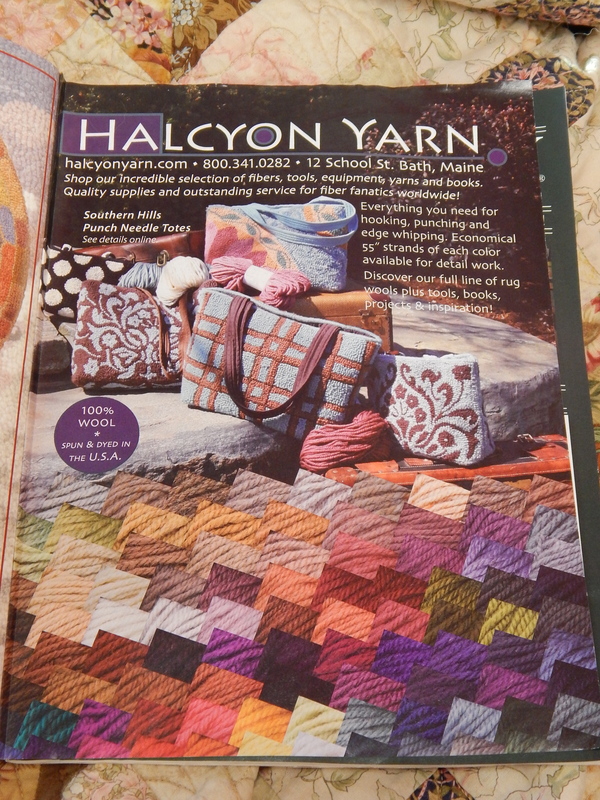 And since I finished my kantha blanket and am taking a break from the Wonderful Counselor embroidery, I needed something to work on. Out came the big mitered square blanket. I laid it out on my bed and marked how much larger I want it to be, so at least I now have an ending place in mind. Still a lot to do on it. 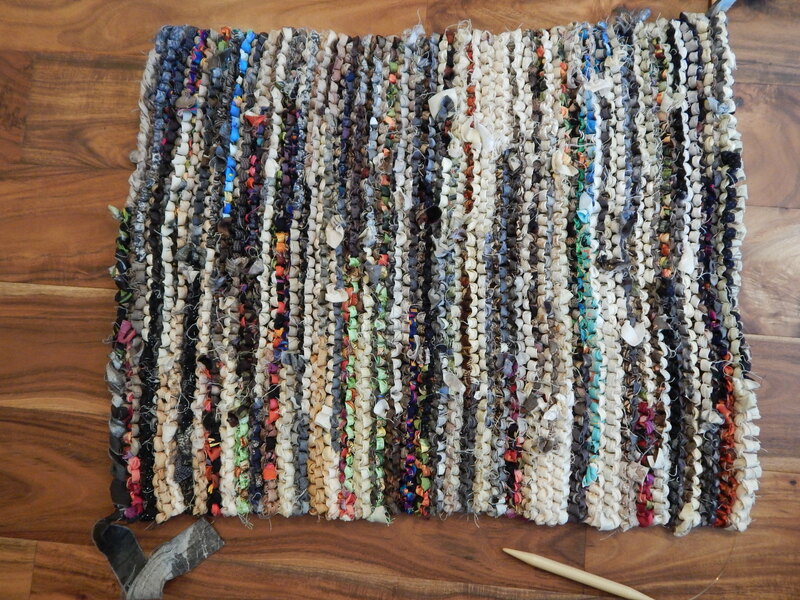 I’m using bits and pieces of leftover yarns and some of my old handspun yarn too. 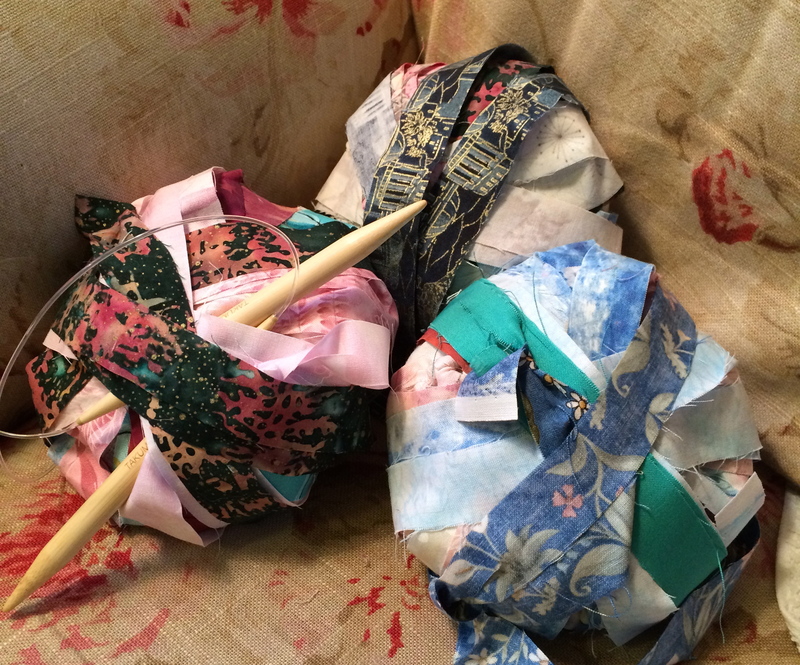 Sunday my sister called and asked if I had ever made a jelly roll quilt. 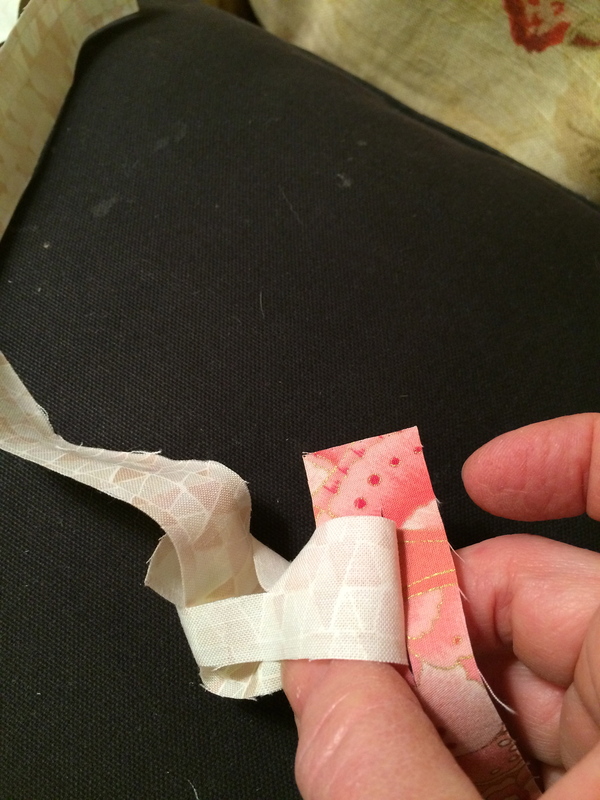 Well, once I made a top using hand cut strips, basically the same as a jelly roll. 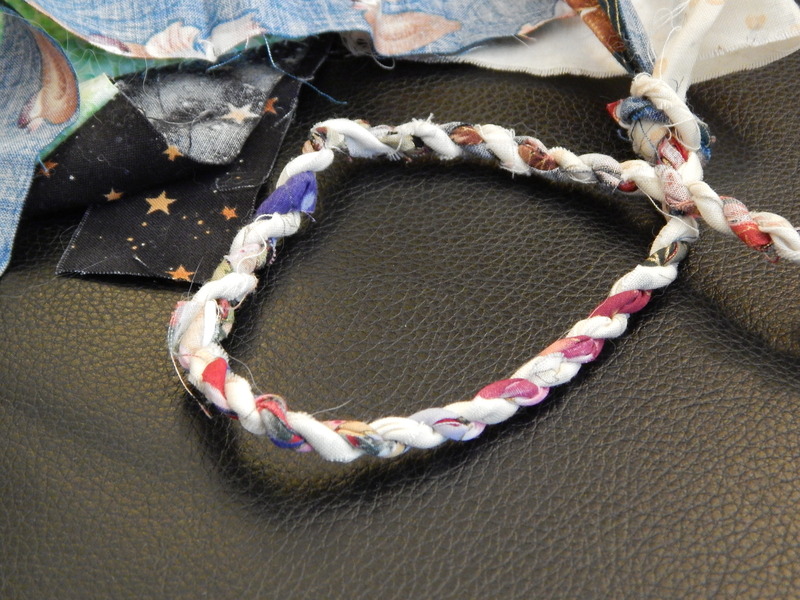 As I talked with her about the math and how to do it, I remembered I had a project box with some leftover strips in it–leftover from the big PEACE quilt. They were cut 1/2 inch finished and 1 1/2 inch finished. 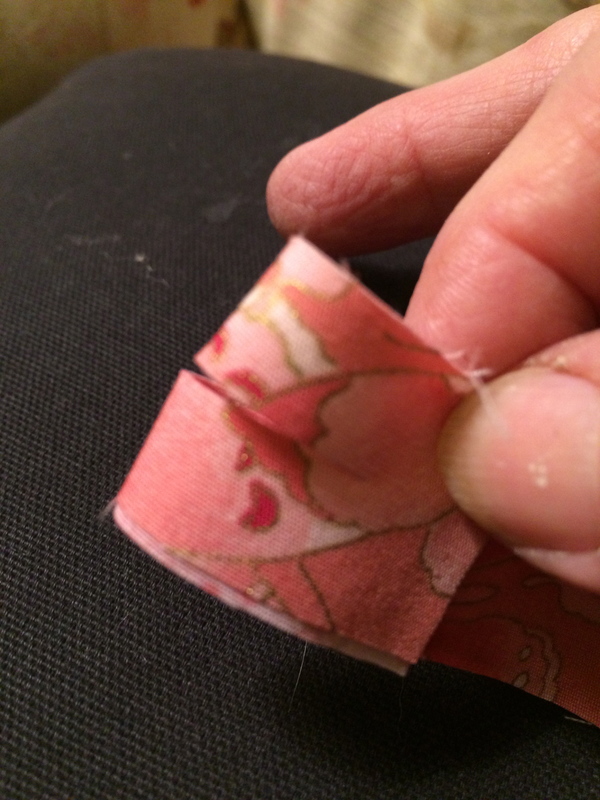 Most of the 1/2 inch strips were brights and darks. 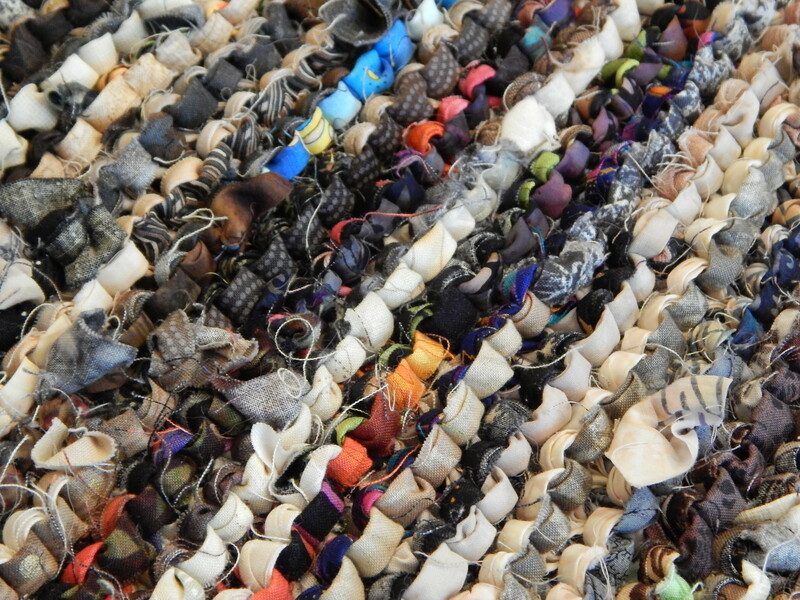 Most of the 1 1/2 inch strips were neutrals. So I started sewing those together. 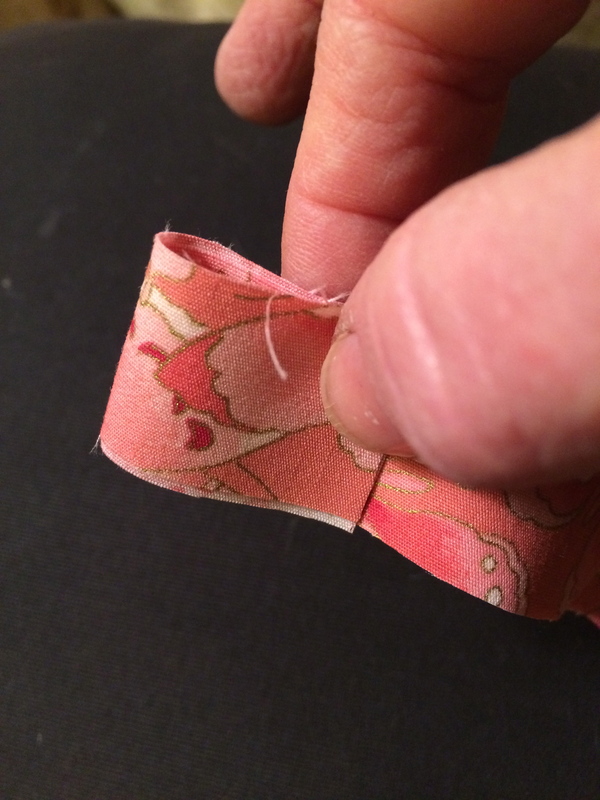 I couldn’t believe it when I sewed the narrow and wider strips together–they were exactly the same length! 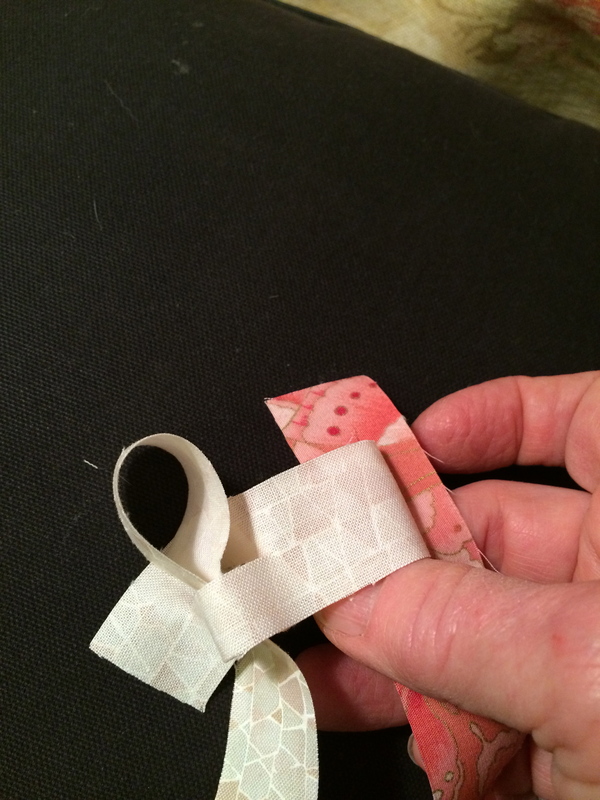 So then I did a little math, and realized that there still was not enough for a decent sized quilt. I did some more math, and decided that if I would make some 3 inch finished strips, that would make the quilt big enough. 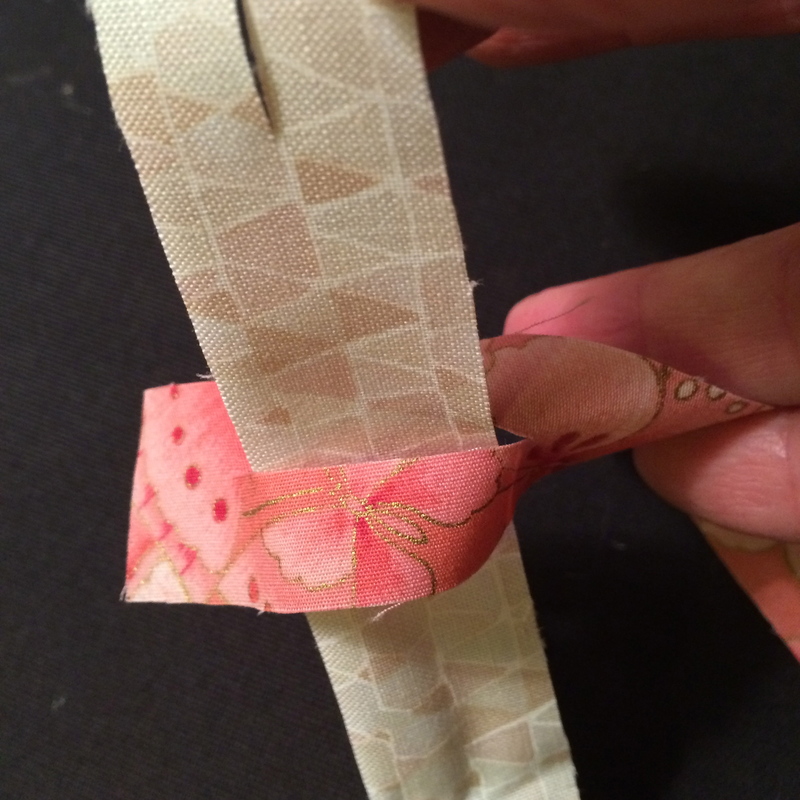 For the 3 inch strips, I used both neutral and bright fabrics. 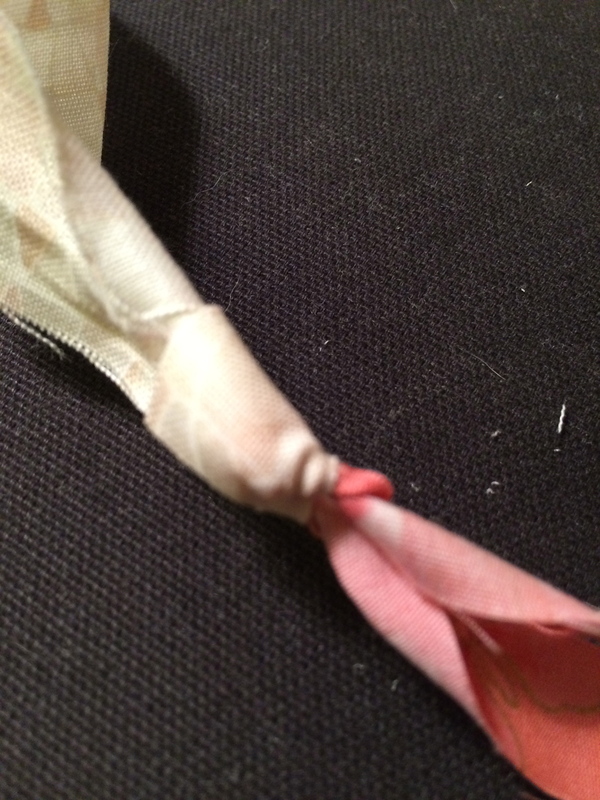 I sewed everything together without planning. 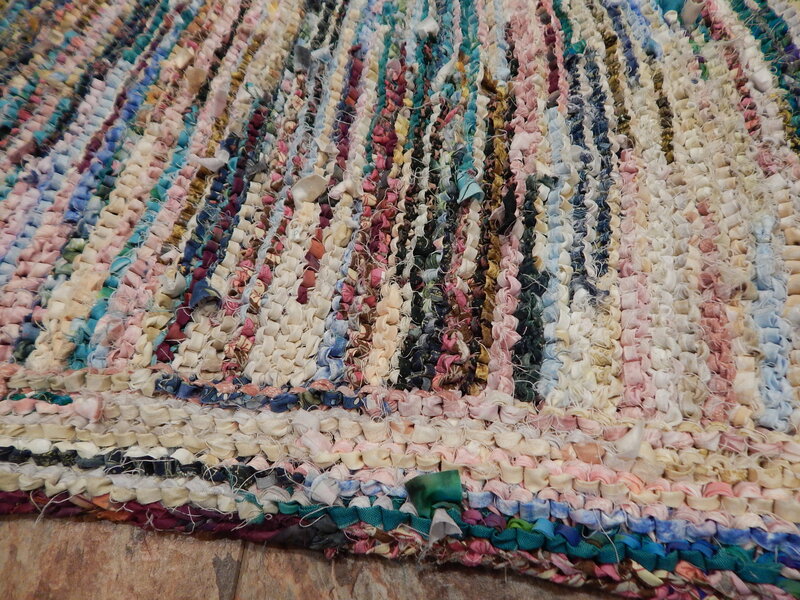 And when I finally finished, and threw it on my bed, I was really pleased with how pretty it was. Now I’m just thinking about how to quilt it. 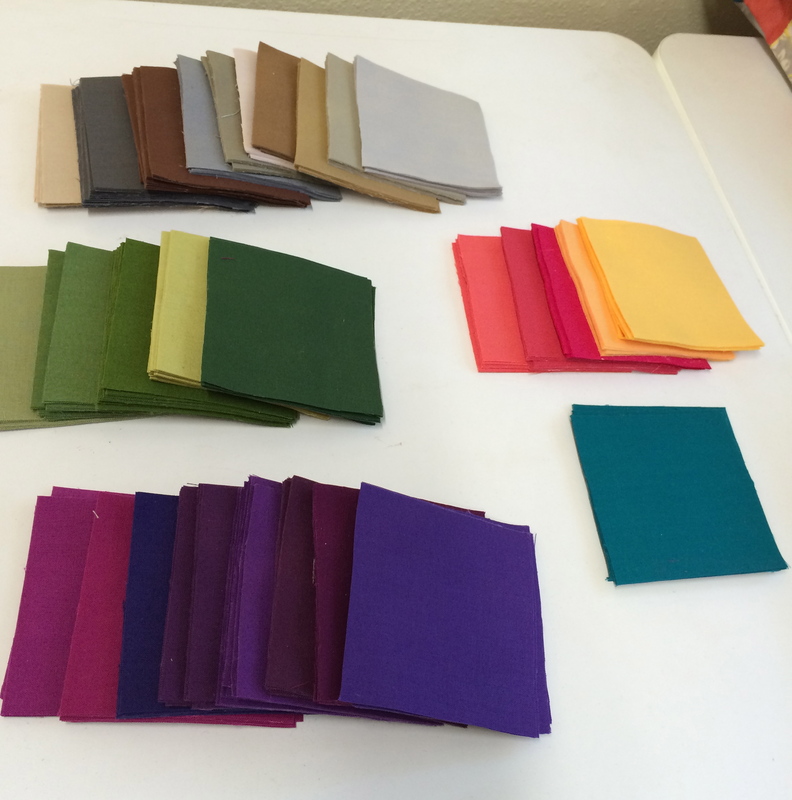 Speaking of quilting, one thing I have been doing lately, is going to Joann’s when they have a sale on (haha, when do they NOT have a sale on,) and buying four or more yards of one fabric so that I have quilt backs for my never-ending box of quilt tops that I have not finished. Since I don’t seem to be too good at selling, I have enjoyed finding places to donate quilts for people that might enjoy them. A young couple I met are working with Afghan refugees that are coming to Sacramento. I told them I could send some quilts to them. I hope all of you are enjoying your creative time. Just working consistently every day it is surprising how much you can accomplish. 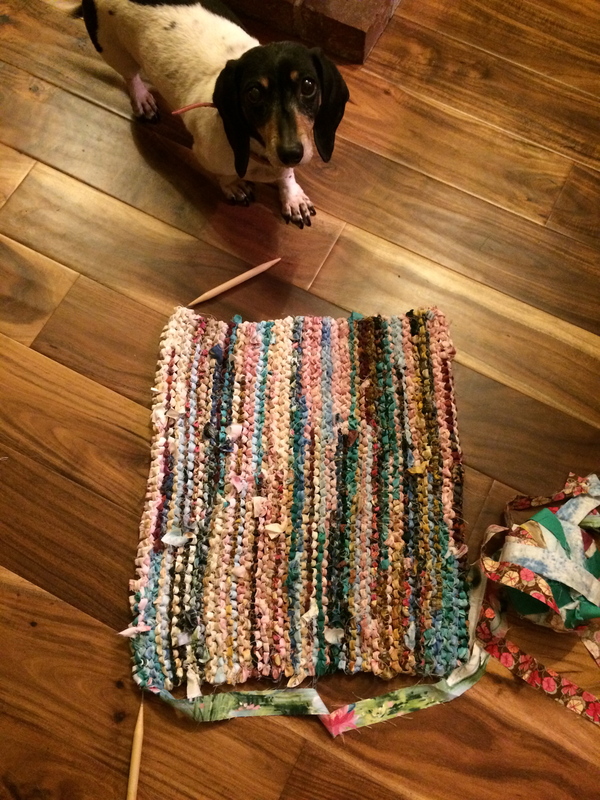 When I was in Anaheim for my rug hooking retreat, my friend Shelley wrote about a new knitting project she was working on–a blanket made out of leftover yarn and mitered squares. Before I became a quilter I spun and knit all the time, and mitered squares were one of my favorite techniques. I do still have lots of leftover yarn from my knitting days, and now I can’t stop. Just one more square…. If you haven’t tried mitered square knitting, don’t start. I’m warning you. Its addicting. I’ll be back later to catch you up on other projects I am working on. I made the giant nine patch quilt top into a sandwich. First I made a pieced back for it. I’ll have to show you that after the quilting is finished. And I started working on the little snowball quilt idea I had. You can see that most of the blocks are 3 inch finished blocks. Then I made six, nine, twelve, and fifteen inch blocks to insert into the quilt. I thought of a lot of different ways to do this, but I ended up using the original little sketch I had drawn in my journal. I love having my little journal with me! I still have a lot of the 3 1/2 inch squares that I pre-cut for this quilt. I have another little idea in the works for them. 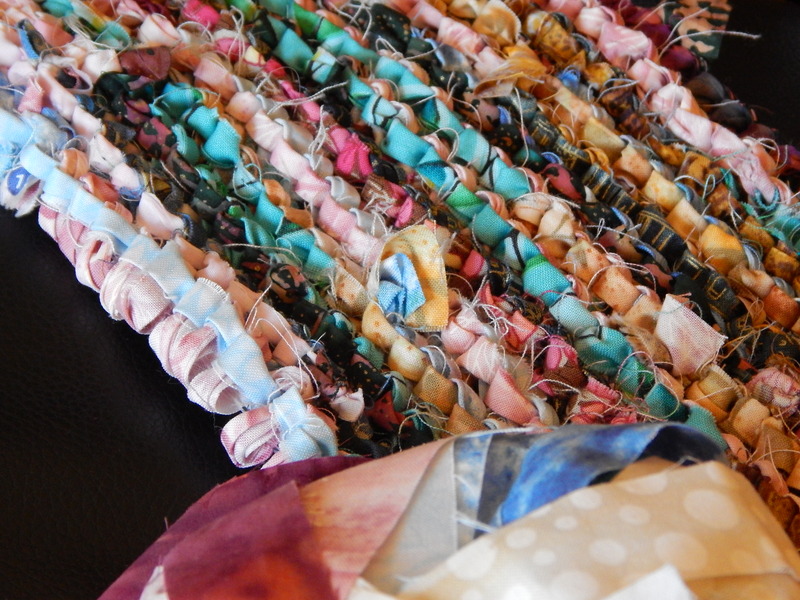 In the evenings, I usually move into the living room and have some handwork in progress. 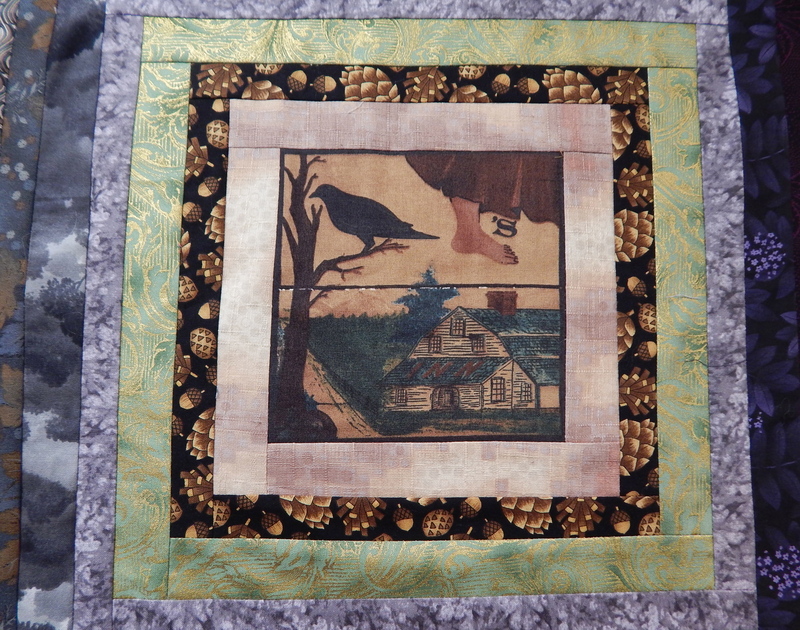 I’m working on another of The Psalms quilts. Here you can see I machine stitched in the ditch to stabilize the background. 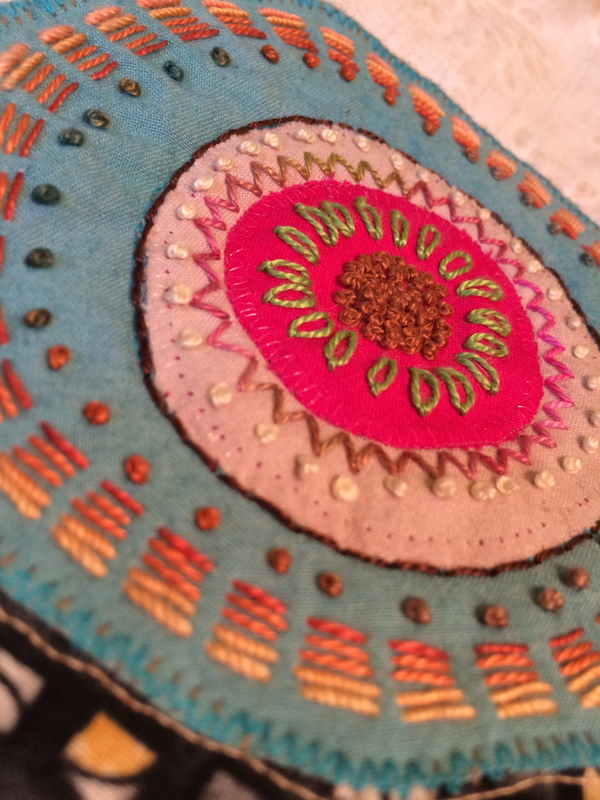 But then I decided to do kantha style stitching over the entire background. 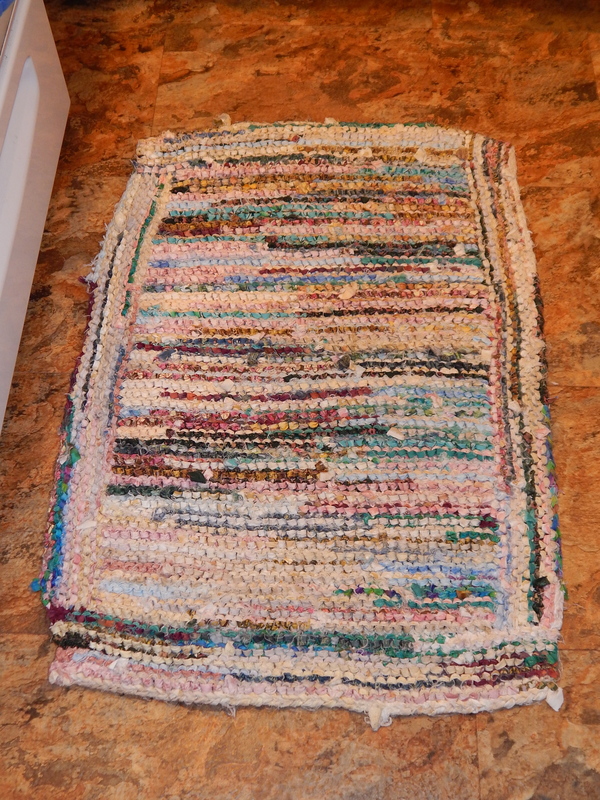 And I finished the rug made from fabric strips. These rugs are so cushy to stand on. I really like having them in the kitchen, and they wash very easily too. Its just right in front of the stove. And the little girls like to lay on them when they are waiting for me to make their meals!